Who put Walter Pigeon on a Hit List? Thursday morning, after Elizabeth let me out of the car at the bookshop, I did my usual security check of the parking lot before heading in to greet customers. Usually this process just involves checking to see if Isabella the bulldog at the Greek restaurant next door left me any messages, and maybe leaving her a message to say I received and understood hers, but this was not the case on Thursday. On Thursday, I found a visitor who was desperately in need of help. I was about to pick him up and bring him to Elizabeth, but she saw me heading into the corner and knew by the way I was striding that I’d seen something she needed to know about. She’s pretty smart, my scribe is [Scribal note: Thank you, Stella.]. When she saw me lean in to pick our visitor up, she said, “Leave it, Stella!” That means she thinks it’s something she needs to look after, or that it might not be safe for me. So, I backed up. Elizabeth took me into the shop. Then she went up to the attics and pulled out an empty liquor box. She put a cloth bag in the bottom and ran back outside with it. I could hear her running around and talking to our visitor, who was a little bit frightened of her, I think. She caught the visitor and gently put him in the box. Then she closed the flaps, found some heavier cardboard and a brick to put on top. She left an air hole so the captive could breathe, and carried it all downstairs. Then she washed her hands. I was very curious to know what was going on. I trust Elizabeth to do the right thing. But her behaviour was very curious. I couldn’t understand why she would put our guest in a closed box. Usually, they are welcome to just come in and walk around the shop! Lil explained that several pigeons had come in from our that seemed to be poisoned. She thought maybe the tackiness was drying pigeon vomit. Eeeeuw. I went and got a drink of water. I’d had the pigeon in my mouth. I could have told Elizabeth it wasn’t blood that was making the flapper tacky. But she hadn’t asked me. Still, I hadn’t thought it was… you know. Yech! After the call, The Scribe told me Lil the Egg Lady was coming to get the pigeon soon. It would stay quiet in the box, thinking it was night. If it was injured, then it was safer there than in the parking lot or lane. Big Croaking Black Flappers live there, too, and they like to eat pigeons. Walter (Elizabeth’s idea to call him that) was fortunate that I found him. Well, Lil the Egg Lady came and took Walter to rehab. The day went on as usual. Later in the afternoon, Elizabeth got in touch with Lil and asked her how Walter was doing. Was he badly hurt? Was he going to be all right? The answer was shocking. “I took some photos and hope to also add to my blog. Poor Walter! He would have died a gruesome death if I hadn’t found him when I did. He could have starved or died of thirst or been attacked by a cat or Raven… How could two-leggers do such a horrible thing! Like Elizabeth, I fail to see how these gentle Rock Doves could possibly bother anyone. They live on the downtown rooftops, minding their own business. They frequently fly over a couple of blocks to hang out at their diner along the railway tracks, where they eat grain that has spilled out of the grain cars. They’re pretty friendly chaps, and they make a lovely sort of purring coo noise that travels down the chimneys in the wintertime (they congregate around the chimney openings to get warm in the winter). You can see how Walter’s feathers are stuck together so he can’t fly anymore. Oh, dear… It looks like I left some of my wool on him. I feel confident that Lil the Egg Lady will look after him well. We’ll be keeping tabs on his progress when she visits us at the shop, too. And if I catch the two-legger who’s laying traps like this in our neighbourhood, GRRRRR… I might not be able to keep myself from biting him/her! If you know who it is, PLEASE! tell them to STOP! Last Friday, I had an appointment with my vet friends. Elizabeth made it for late in the afternoon so we could go straight home when we were done. I haven’t been there for a long time so, I was looking forward to the visit. Even if it meant getting stuck full of needles, poked and prodded in inconvenient places, and showing the world at large that I gained two pounds over the winter. We sat down in Dr. Celia’s examining room. The two-leggers talked while I checked out all the interesting smells, then made myself comfortable over by the nearest exit. Then my ears pricked up. “How many lives has she used up now?” Dr. Celia laughed. I got up and gave them both a dirty look. Then I took a few steps over to the other side of the room and squeezed under the examining table. Yes, I used up another life with my latest adventure. And, yes, I was a little the worse for wear for a couple of days. A week ago Thursday was a lovely Spring day, if you like that sort of thing. I prefer snow and the deep chill of Winter, myself. Elizabeth decided it was time to do some work in the garden, which is still frozen solid once you dig down a couple of inches. But she gets excited about these things. I lay just outside the fence guarding until it looked like she was ready to get me my supper. Then I wandered over to the back stoop and watched the last of the snow melt from behind the wood pile. Elizabeth was just about to open the door when I heard them. My friends, the long-necked flappers, were flying in low and calling me to say hello! I thought they were in England visiting my blogging friend Clowie, but I guess those were different long-necked flappers. They all look and sound very much alike, you know. I’ve been working long hours at the bookshop so, when they invited me to play a game of tag, I was eager to join in for the exercise! Needless to say, I ran off to greet them. The thing about long-necked flappers is that they have an unfair advantage in a game of tag. When they flap their wings, they rise off the ground. It’s a bit of a tease. Usually, I just stop and watch them play the game. Today, though, their advantage over the river was not so great. The splashy wet stuff hadn’t turned splashy yet. It still looked pretty hard, except where it had melted out to about a meter from shore. I ran back and forth a bit to find a place to get onto the hard surface. Elizabeth was calling me. I ignored her. I could come and eat later. I discovered that I could use Al and Joanne’s dock like a bridge. Its end was still firmly planted in the hard water. When I leapt out onto the hard water, the geese, who had landed to wait for me, took off, flying low over the hard water to Siggy’s Island. I almost caught up to them. I was just at the end of our point when, suddenly, the hard water slivered and dissolved beneath me! I went right under into deep, cold, splashy wet stuff. I’ve never felt it that cold before! I found the hole and came up for air and began trying to get back onto the hard water or land. I went in just off The Point, but there was hard water all around the hole I found myself in. The second and larger point is Siggy’s Island. Elizabeth, who had been yelling frantically at me to come and eat stopped. Instead, she screamed, “I’m coming, Stella! Keep swimming!” My head went under again. Later, she told me how frantic she was. She threw her gloves up at the living room window to get Kay’s attention, yelled for Kay to phone Dan on Siggy’s Island. He has a rice boat that uses an airplane propeller to go across water or ice. She thought if he had it going (they just got back from Mexico), he could get to me faster than she could. She had to run around our bay to get to where I was, and that’s a long, rough run for a two-legger. But off she went! On the way she saw a long piece of driftwood with a big crook in the end, and she grabbed it in case she needed something to help her pull me out. It’s hard to tell from the house how far out from shore something is exactly. Best to be prepared. She could also use it to break a channel through the ice for me to swim to shore. Maybe. That’s what she was hoping. Looking toward the end of the bay along the shore that faces south. This is the easy part of the trip, but it’s still faster to go through the woods. Elizabeth is asthmatic. The woods are full of snow and leaf mould. She was breathing hard. She didn’t have her puffer. But she kept coming as fast as she could and calling to me to keep trying! And, somehow, I found some really hard water, and I managed to get up onto it. I woofed to let Elizabeth know I was okay, and I ran to find her. When she saw me, she just sort of sat abruptly on the shore, while I ran toward her. But I wasn’t going to go home until I was sure she was all right. I just got to her when I heard a strange growly beast on the other side of the house. So I didn’t stop. I just kept on running back the way Elizabeth had come overland. I left Elizabeth sitting on the shore, waiting for her lungs to settle enough that she could make the walk home. She was thinking, Why would Dan come that way? That can’t be Dan! Kay had phoned 911 and told them, “Stella’s gone through the ice!” (Kay had a stroke in November. I’m not sure just what that means, but it has made it harder for her to get around, and it has made her hard to understand sometimes, especially when she is tired or upset about something). Elizabeth could hear snatches of conversation, “We don’t rescue animals when they go through the ice…” Then she saw me on the far shore, back at Al and Joanne’s dock, looking for my long-necked flapper friends again. I was afraid that they might have gone through while I was intent on my own struggles. I ran back out onto the ice to find them. Elizabeth tried to call over to the fire chief and Kay, who were now chatting, him on the lawn, her up on our balcony. “HONK THE CAR HORN!” Elizabeth couldn’t get enough air into her lungs to support her voice, and they couldn’t hear her. She knew that if I heard the growly beast horn, I would run home. Nothing trumps a ride. Nothing. And the horn sounding means we’re going to go for a ride. When I hear the horn, I stop everything and race for the ride. She got up and started to head for home. She knew I was too wound up to listen to anything but (maybe) the growly beast’s horn. So, that became her focus. But by this time, she was having so much trouble breathing that she was also having trouble walking through the woods. About halfway home, she tried calling the two-leggers at the house again. “WHAT DID YOU SAY?” The fire chief had heard her. She took as big a breath as she could. “HONK.” Another breath, “OUR.” A third breath, “CAR.” And another, “HORN!” She slid down a rock face to the mud flats at the end of our bay. She heard the fire chief tell Kay what she had called, and a few seconds later, HONK, HONK, HONK, HONK! I heard the horn, though, and it caught my attention. That’s strange, I thought. I’d better go check that out! By that time I was back on land again, some distance east of where Elizabeth was. I met her as she was crossing the mud flats. I got close enough to her that she was able to grab my collar. That’s when I realised that she needed help if she was going to get home. We got to the other side of the mud, then I pulled her up the bank to her trail. We would walk a bit, then she’d rest, then we’d go a bit further up the hill toward the house. When we emerged from the woods, I led her to the bench by the gardens and she sat down. But by this time, Kay had remembered that her daughter might be having trouble, and told the fire chief that Elizabeth had asthma. So he’d gone off looking for her! And that’s what Kay did. Amazingly, it works for fire chiefs, too! The hard water looks much more rotten now, and for the last week, Elizabeth won’t let me go outside unless I’m on the leash. She does that every spring and autumn when the river isn’t safe. This year has been a bit strange, and the change happened very quickly, so she wasn’t aware that the time had come to be more cautious. The deer almost got to shore when it turned around and went back through the channel it had cut. It was so close to the end of the point. So close. But it didn’t make it. Today the big white-headed black flappers and lots of croaking and cawing black birds are feasting. A raven (on the rotten hard water) and an immature bald eagle on the rocky end of the point this morning. The raven is actually standing on the bit of deer carcass that is above the water line. Watching the activity through our window I feel a little unnerved. There, but for the grace of God, go I. There isn’t much left that the birds can reach now. With the shorter days and cooler temperatures, a lot of our summer flappers are disappearing. Elizabeth says they go south where it is warmer, brighter and there is still plenty of food crawling around for them to eat. We still have a few around, though, and of course there are some that stay with us all year. I asked Elizabeth if we could try to get some pictures of them for you to look at. You know… since there aren’t very many new flowers to show you. Last year, the Robin family decided to try nesting on the house. They built a nest right over the spot where the telephone line meets the wall. The eggs hatched and their puppies fledged. For the most part, they were very well behaved youngsters. They only got rowdy when one of the parental units came with food for them. 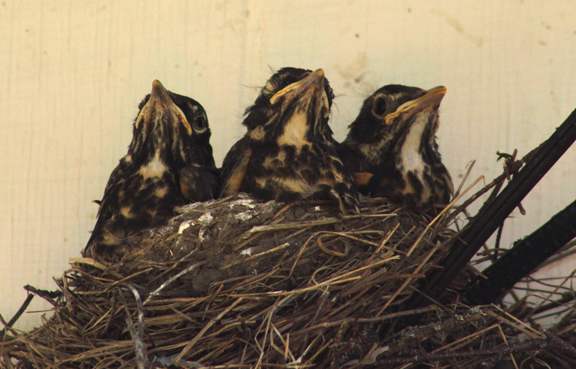 Elizabeth took a photo of the American Robin (Turdus migratorius) chicks last year. I don’t know why we didn’t write about them then. Here they are, quietly awaiting their earthworm supper. The next day these little fellows were flying out of the nest. That was a very good thing, because the very night they were gone, a huge storm blew in. Five trees fell on the telephone and hydro lines, not breaking them, but pulling over the hydro pole. This in turn pulled the wires the nest was built on right out of the wall! The nest fell to the ground. 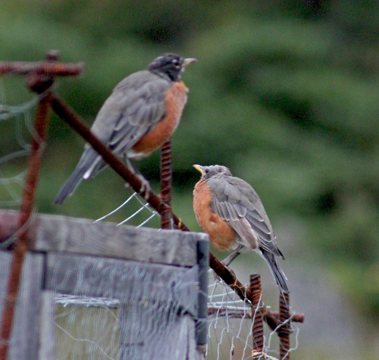 This year, the Robins came back in the spring. They decided that maybe that spot wasn’t the best location for a nest. They built a bigger nest in a more sheltered place: right behind the attic fan cover, just under the eaves of the house. It was a smart place to build because the crows and jays were too big to rob the nest, and the fan’s motor drowned out the peeps of the babies. They were ultra secure there. Papa Robin had a few anxious days when another male started hanging around the nest. Wouldn’t leave, even after Papa made a few threatening dives at the intruder. 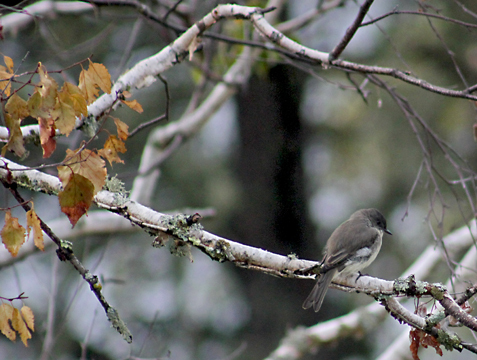 Elizabeth heard Mr. Robin at the bathroom window one morning and ran in to see what all the ruckus was about. It turns out his adversary was not another Robin, but rather his own reflection in the glass. Elizabeth shooed him away and he seemed after that to realise his mistake. They look pretty cold, don’t they. I think maybe this chilly morning was enough to push them into following a warmer isotherm south. They eat a lot of insects so, after a frost, food get scarce fast! The Magpie has been back several times. It is still finding lots of grasshoppers to eat. It is extremely shy, however, so we have no new photos to show you. Not all flappers eat insects. Some eat other types of food that are only available in the summer. 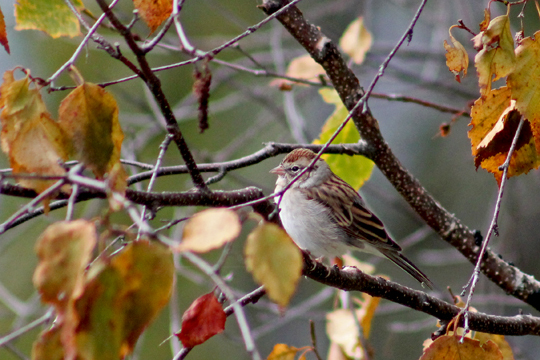 This is a Chipping Sparrow (Spizella passerina). They are one of the first flappers to come back in the spring. I think these seed-eaters follow the flapper feeders North! Some flappers stay with us year round, though. Elizabeth told me earlier this Summer that she was feeling sad. 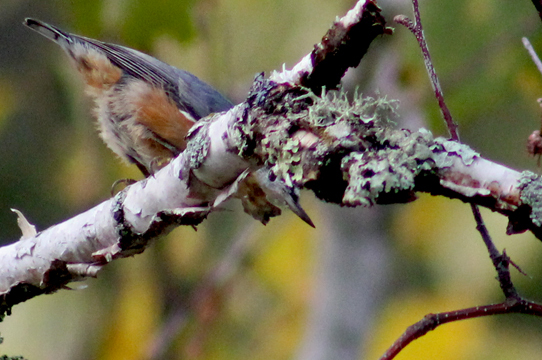 For almost a year, there have been no Nuthatches around. 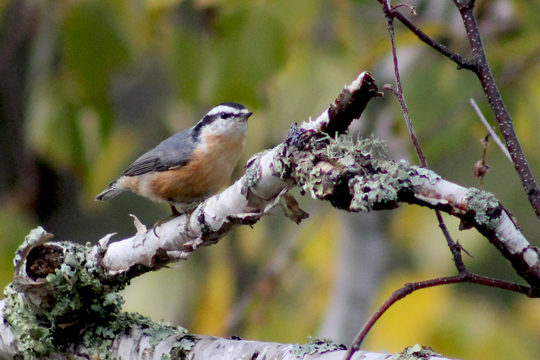 Nuthatches have a special place in Elizabeth’s heart for some reason. They seem to like her, too. 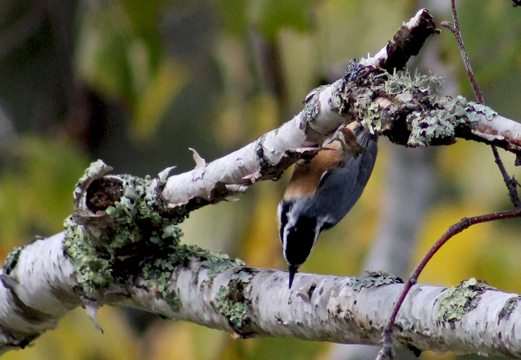 As she was trying to get a picture of an elusive warbler of some sort, a Nuthatch flew in and landed right on Elizabeth’s backside! It stayed perched there for a few minutes, listening for insects. Then it, too, headed over to the more productive Paper Birch. 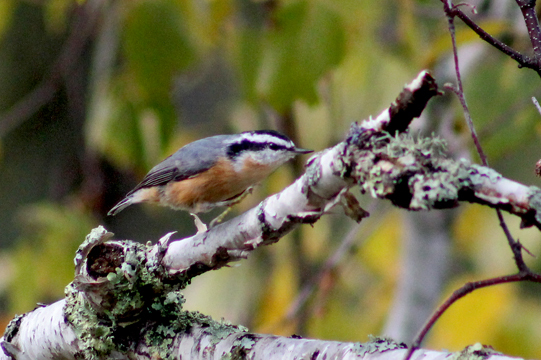 The Red-breasted Nuthatch (Sitta canadensis) is a pretty little flapper. 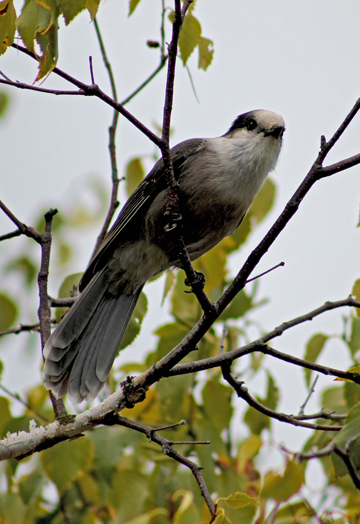 From its latin name, you can see that it must make a habit of sitting on Canadians. It is also a voracious insect hunter. They have specially adapted toes that allow them to climb up and down trees. In the winter, they find the insects sleeping just under the tree bark. I guess they hear the insects snoring. While she was busy celebrating the return of her old friends (these little fellows can live for over seven years), someone else decided to join the party for at least long enough to discover whether there was any kibble on offer. No kibble for the Kibble Snatcher family this time. And no. Cameras are not edible! Fly away, you silly clowns!